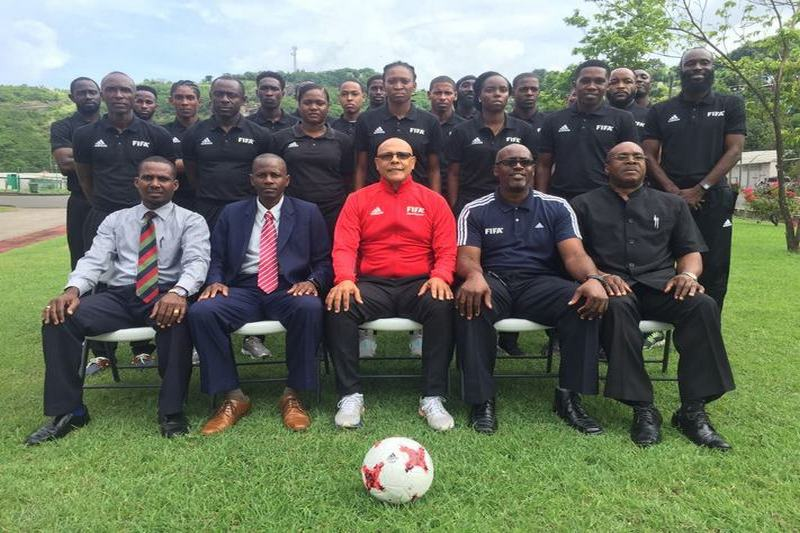 The Grenada Football Association was privileged once again to conduct a FIFA Member Association Referees Course from the 16 - 20 July, 2018. FIFA has been making those courses available to all their members as a means of development of the game. The course was facilitated by FIFA Technical Instructor Mr. Peter Prendergast from Jamaica and our two local Instructors Mr. Valman Bedeau, Referees Officer and Technical Instructor and Mr. Earnest Richardson, Fitness Instructor. Twenty two persons participated in the course. Nineteen males and three females. The participants were engaged in both theory and practical sessions including a FIFA Fitness Test. Topics covered over the week were, Understanding Modern Game, the New Amendments to the laws of the game, Tackles and challenges in the penalty area, Off sides and Trivia's just to name a few. Present at the opening ceremony were, the 1st Vice President of the GFA and Chairman of Referees Committee, Mr. Allan James, the General Secretary, Mr. Ken Whiteman and the Instructors. At the end of the course, the match officials were issued with certificate of attendance.